It’s impossible to pinpoint the exact moment when that sound and scene coalesced into something cohesive enough to merit a name, but then again none of the labels people came up with—cosmic cowboy, progressive country, redneck rock, and, ultimately, outlaw country—made everyone happy. 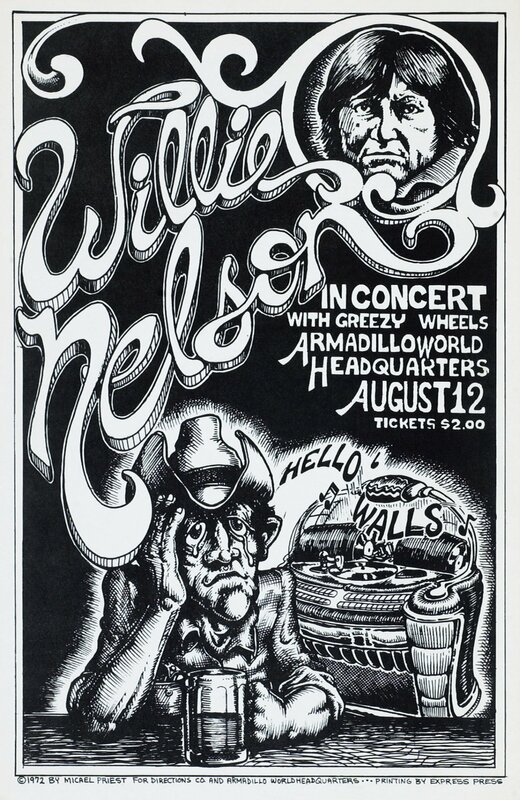 Still, the pivotal year was 1972, and the place was Austin. Liquor by the drink had finally become legal in Texas, which prompted the folkies to migrate from coffeehouses to bars, turning their music into something you drank to. Songwriters moved to town, like Michael Murphey, a good-looking Dallas kid who’d written for performers such as the Monkees and Kenny Rogers in L.A. He was soon joined by Jerry Jeff Walker, a folkie from New York who’d had a radio hit when the Nitty Gritty Dirt Band covered his song “Mr. Bojangles.” In March, Willie played a three-day country festival outside town, the Dripping Springs Reunion, that would grow into his Fourth of July Picnics. Then he too moved to Austin and started building an audience that didn’t look like or care about any Nashville ideal.